Roger Nichols, who has died aged 66, was an American sound engineer and inventor best known for his work with the jazz-rock group Steely Dan, with whom he produced some of the highest fidelity recordings ever made. Nichols worked with the group throughout their heyday in the 1970s and during later sporadic recordings, as the musicians built a peerless reputation for meticulous attention to detail and exceptional clarity of sound. He won seven Grammies, six of them for Steely Dan albums, the first being their 1977 masterpiece Aja and, most recently, three awards for Two Against Nature (2000). The other Grammy was for his role as producer of the less fashionable country artist John Denver, with whom he had a close association – based on their mutual passion for gadgets and amateur aviation – from 1980 until Denver’s death in a plane crash in 1997. Among the other prominent artists on whose records Nichols worked were Bobby “Blue” Bland, Johnny Winter, Ricky Lee Jones, Placido Domingo, Frank Sinatra, Diana Ross, and The Beach Boys. During his limited spare time, Nichols was also a Scuba diving instructor and an amateur motor-racing photographer whose work was regularly published . He also designed the Wendel drum machine/sampler, first used in 1979 on Steely Dan’s Gaucho album. The group’s core members, Walter Becker and Donald Fagen, nicknamed Nichols “The Immortal” because he mysteriously avoided electrocution in a potentially fatal studio accident. Despite the exacting requirements and excessive workload the band placed on him, he thrived on working with them and their producer Gary Katz. Roger Scott Nichols was born in Oakland, California, on September 22 1944. His father flew B47s in the US Air Force and the family lived all over America, but when he left the military in 1957 they settled at Cucamonga, southern California. There Roger attended the same high school as Frank Zappa, of whose guitar playing he made experimental home-recordings on a basic reel-to-reel deck. After graduating in Nuclear Physics at Oregon State University, Nichols worked at the San Onofre nuclear power plant as a nuclear operator from 1965 to 1968. He was simultaneously developing a passionate interest in audio equipment, mainly because he hated the “clicks, pops and ticks” he would hear on records. With two friends he began making recordings at jazz clubs and built a recording studio in Torrance. They started by recording local high school bands and then set up a hi-fi store supplying custom equipment to music industry professionals, thus making many contacts. Karen Carpenter, Larry Carlton and Kenny Rogers were among clients that used the studio, and they eventually began supplying others, including the ABC network. In 1970, ABC hired Nichols to do studio maintenance and engineering, and the following year Katz arrived with the New Yorkers, Becker and Fagen. Since no one else had much notion of how to deal with them, Nichols began working with them, and they instantly found common ground in their dedication to “hi-fi”. 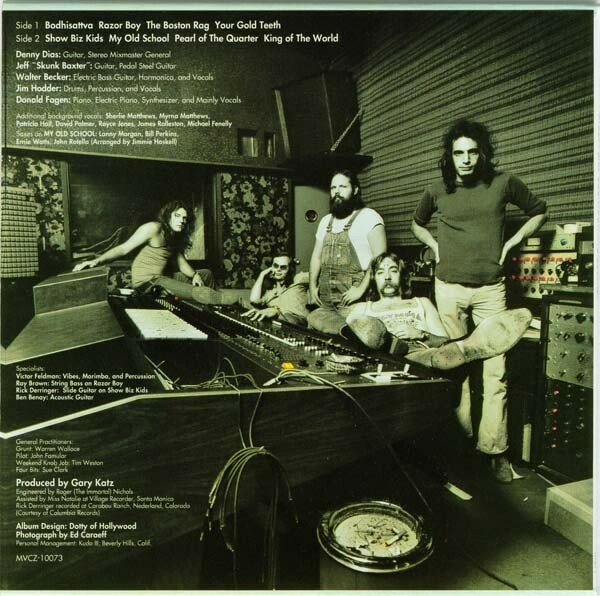 With Katz taking a mostly “executive” role as producer, responsible for getting the best vocal performances out of Fagen, Nichols was responsible for capturing the music on tape, with lustrous results. Their first two albums — Can’t Buy A Thrill (1972) and Countdown To Ecstasy (1973) — were unusual for their lack of EQ (or “equalisation”), a routinely-used technique for manipulating the relative strength of frequencies. Instead, Nichols concentrated on careful microphone placement. Another of his ideas that became a Steely Dan trademark was double-tracking Fagen’s vocals, and mixing one of the unison doubles at around 75 per cent of the volume of the other. This subtle effect gave his vocals the desired “thickness” without being as obvious as other double tracking methods. Steely Dan soon effectively became a duo, spending months recording each of their albums with the cream of LA’s session musicians. Their perfectionist approach meant that they never made backup copies of master tapes (since this would inevitably mean a reduction in sound quality). But this sometimes worked against them. During the making of Katy Lied (1975), one of their 24-track masters was accidentally erased by an assistant engineer, and a song from the Gaucho sessions was lost in another accident; although the group spent $60,000 trying to re-create it, they finally rejected the results. After Steely Dan announced their split, Nichols also worked on Fagen’s first solo album, Nightfly (1982), considered a benchmark of quality by audiophiles. For the follow-up Kamakiriad (1993), Nichols said that two years were spent programming the drum machines to get “just the right feel” to meet Fagen’s increasingly fastidious standards. The following year Nichols also engineered and mixed Becker’s solo debut, 11 Tracks Of Whack. When Steely Dan re-formed, he worked on Alive in America (1995), Two Against Nature and Everything Must Go (2003). In his later career Nichols spread his knowledge internationally in “master class workshops” and as a technical consultant. In 2005 he won a National Recording Academy of Arts and Sciences Lifetime Achievement Award and set up his company, Roger Nichols Digital. Roger Nichols spent the last year of his life battling pancreatic cancer, treatment for which nearly bankrupted his family. He died on April 9, and is survived by his wife Conrad Reeder, a writer and musician, and by two daughters .